The portrait of Patrick Colquhoun that hangs in the Thames Police Museum at Wapping where the force has been based for over two hundred years. The red book on the table is his treatise on the policing of the metropolis. One of a pair of portraits by an unknown artist (the other featuring London Bridge), it was donated to the museum by the vicar of Christ Church, Spitalfields. Image courtesy of the Thames Police Association. 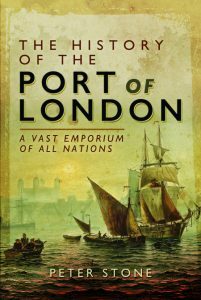 By the late 18th century the Port of London was handling a vast amount of cargo, accounting for two thirds of the nation’s maritime trade. Yet customs regulations dating back to the mid-16th century during the reign of Queen Elizabeth dictated that all imports must pass through a small number of ‘Legal Quays’ in the City of London measuring a mere one thousand four hundred feet in length. This caused a major bottleneck and at any one time hundreds of ships were lined up along the Thames, often for weeks on end, waiting to unload. Even in the early part of that century the writer Daniel Defoe wrote of the Thames being a sea of masts as ships anchored alongside each other. Such was the congestion that it was impossible for ships to actually reach the designated quays. Cargoes had to be offloaded onto smaller boats that then negotiated their way around the other moored vessels to reach the designated spot where goods were required to be landed. Yet the congestion did not end there: the quaysides and surrounding streets were also full to bursting and cargoes sat waiting to be inspected for lengthy periods before they could be carted away. Valuable cargoes were left on moored ships for days or weeks on end, guarded by skeleton crews. They were then shifted to the quay by low-paid watermen of often dubious character, and sat on the quaysides in chaotic circumstances waiting to be checked. In such conditions it is not surprising that theft was rife. Thousands of port labourers and even customs officers were profiting from dishonesty controlled by receivers – apparently respectable businessmen – known as Copemen. John Harriott, originating from Essex, returned from America in 1795 and settled at Goodman’s Fields just to the east of the City. He was an active man, having by then served in the Royal Navy from the age of thirteen, as a seaman in the merchant navy, lived with indigenous North Americans, was wounded while fighting for the East India Company, and, as a farmer, had reclaimed land from the sea in Essex. Harriott had a close relationship with his uncle, John Staples, a London stipendiary magistrate with a great knowledge of crime on the river. Discussions between the two led Harriott to draw up plans for a police force to protect shipping on the river. When approached with the idea the Lord Mayor of London gave the opinion that this was not the business of the City. The plan advanced no further with the Home Secretary, the Duke of Portland, when it was presented to him in October 1797. Shortly afterwards Harriott was introduced to the magistrate, social reformer and statistician Patrick Colquhoun. The previous year Colquhoun had published the first of two editions of his Treatise on the Police of the Metropolis in which he argued for a centrally-organized police force for London, separated from the judiciary, with publicly salaried officers as was the case in France. It was widely read, not least by George III. Colquhoun originated from Dumbarton in Scotland and was a successful merchant in Virginia before being elected as Lord Provost – mayor – of Glasgow. In 1789 he and his family moved to London and three years later he was appointed as a magistrate. Colquhoun was a prolific writer of pamphlets on social issues and also established a soup kitchen at Spitalfields. He worked together with the social philosopher Jeremy Bentham to form his views. Colquhoun’s theories and observations in his Treatise led to him being approached for advice on theft-prevention by London merchants trading with the Caribbean. He estimated that there were eight thousand vessels within four miles below and two miles above London Bridge at any time; and that the amount of property afloat to be seventy-five million pounds, all of which was vulnerable to theft. He listed the various categories of thief working in the port with the slang terms in use. A corrupt revenue officer was a ‘game’; ‘river pirates’ bribed watchmen before making off with a ship or lighter’s cargo; ‘night plunderers’ were gangs who stole from unprotected lighters at night; ‘light horsemen’ were organized gangs who worked with the help of corrupt customs officers; ‘scuffle-hunters’ offered their assistance as porters but simply pilfered goods and made away. Colquhoun’s estimate of goods plundered from the port during 1797 was valued at slightly over half a million pounds. He argued for the establishment of a river police force and the creation of docks where goods could be unloaded behind high walls and security managed, away from the congested, chaotic and insecure Legal Quays. At the end of January 1798 the Committee of the West India Merchants and Planters considered Colquhoun’s proposal for a river police that could protect their cargoes on the Thames. They agreed that the plan should proceed providing it had approval from the government. In March the Duke of Portland wrote to confirm that the Exchequer would contribute financial assistance for the scheme, most likely because the government itself was losing import duties when cargo was stolen. Colquhoun was duly requested by the West Indies Committee to put the plan into operation. In July 1798 the West India Merchants and Planters Marine Police Institution came into being, essentially a private security force, operating from a riverside building at Wapping New Stairs. Wapping was where many ships were moored and it was to that area that large amounts of the stolen cargoes were taken. The Institution initially consisted of twelve staff, patrolling continuously by boat day and night from London Bridge down to Blackwall. The force was part-funded by the government but most of the running cost was paid by the West India merchants. Its primary task was to protect the ships carrying cargoes from the West Indies but their presence on the river was reported as immediately reducing theft from all craft, estimated at over one hundred thousand pounds in the first six months. In 1799 an Act of Parliament was passed authorizing the creation of the West India Docks on the Isle of Dogs, specifically stating that they should be protected by high walls. Colquhoun created a set of strict rules and regulations for the labourers working within there. With the creation of their docks the West India merchants no longer required protection from the security force. Yet its success on the open river led the government to pass the Police Act in 1800, transforming it into a public body called the Marine Police Establishment covering all shipping on the tidal Thames and its tributaries. It is said to be the world’s first organized police force. The magistrates attached to the station had to deal with crimes covering a large area and were obliged to take oaths of each of Kent, Surrey, Essex and Middlesex. Harriott was appointed as the first stipendiary magistrate in residence, a post he held until his death in 1817. The introduction of the Marine Police Establishment was naturally unpopular with those who had much to lose in illegal income. When a coal heaver was arrested for stealing a sack of coal a riot involving several hundred erupted while the case was being dealt with by Harriott in the courtroom in October 1798. Colquhoun and Harriott read the Riot Act on Wapping High Street and ordered them to disperse. Shots were fired by the police but one of the constables, Gabriel Franks, was hit and died two days later, the first British policemen to die while carrying out his duties. The ringleader of the rioters was hanged and six men transported to the colonies for life. Colquhoun wrote of the success of the force in his The Commerce and Policing of the River Thames, which was influential in creating new police bodies in several cities around the world. Over thirty years after the establishment of the Marine Police the London-wide Metropolitan Police was created, with which the river force merged in 1839 as the Thames Division. The Thames police continue to be based at their original location in Wapping. Sources include: Dicky Paterson & Joz Joslin ‘The Thames Police History’; John Pudney ‘London’s Docks’; Oxford Dictionary of National Biography. With thanks to Rob Jeffries of the Thames Police Museum at Wapping for fact-checking and additional information and to Olwen Maynard.